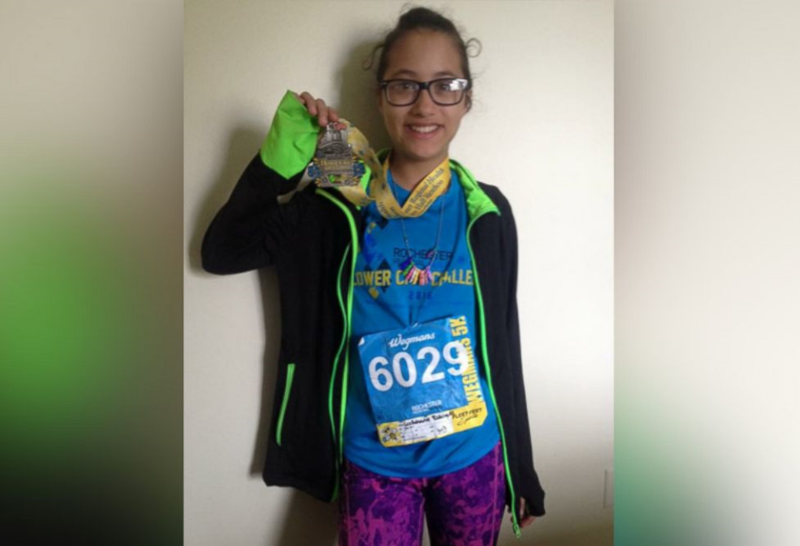 Twelve year old LeeAdianez Rodriguez-Espada was running late to the Wegmans Family 5K race last Saturday. In order to save time, her mom dropped her off near the starting line and went to park the car. Once Lee got to the starting line, she realized that the race had already started. She was told to begin running; and eventually, she was in pace with the rest of the competitors. Lee was so focused on running that it wasn’t until the 4th mile that she realized that she wasn’t running the 5K race. Her mother was worried because those running the 5K were starting to arrive and her daughter was nowhere to be seen. She quickly informed the authorities, and they eventually found her running in the Flower City Half Marathon race. “I see her with a medal and I thought, ‘Oh my gosh, she ran the other one, like for real,'” says Brendalee Espada. “She decided to just keep running and not give up.” “I’m really proud” Lee said after running the race.Lee said that she knew her mom was worried but she had to finish the race. Lee finished in 2 hours and 43 minutes and fell in 1,885 place out of 2,111 runners.